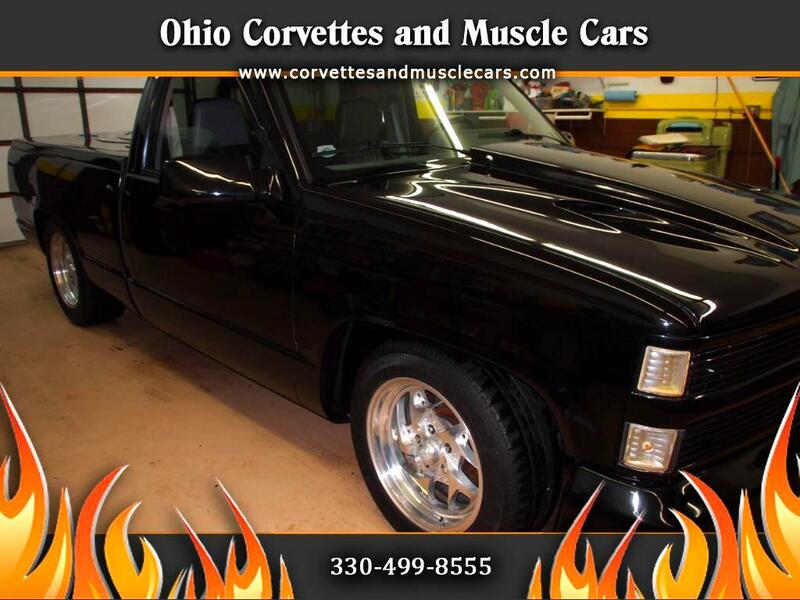 The newest edition to our Custom/Hot Rod inventory is a 1991 Chevrolet Silverado Custom Pick Up. Powering this exceptional truck is a GM 350 crate motor that puts out 330 horsepower which is mated to a 4 speed automatic transmission with a LoKar floor shift, and an Eaton rear end with 3.90 gears. Everything is custom on this beautiful pickup. It features a shaved wiper cowl and door handles, Ram Air hood, smoothed front bumper which is inverted and tucked, Phantom billet grill with recessed headlights. Centerline wheels with 8" front and 10" rear tires finish off the exterior look. The bed cover is a one-of-a-kind raised flame fiberglass with integrated tailgate and purple tuck and roll finish on the inside. The tail lights are frenched '91 Cadillac Coupe de Ville. The small block engine features an Edlebrock 650 cfm carb with Edlebrock intake manifold and headers. The coolest part of this build is the Air Ride Tech front A arm suspension and cantilever 4 link rear with Firestone Air Ride. On the interior there is a Dakota Digital dash, Sony AM/FM stereo, a Grant steering wheel, complete custom leatherette bucket seats from Auto Styles in Clearwater Florida, and a custom fiberglass center console with integrated navigation system. Of course, there are power windows and door locks, a remote door opener and power operated bed cover. We have tons of paperwork with receipts totaling about $18,000.